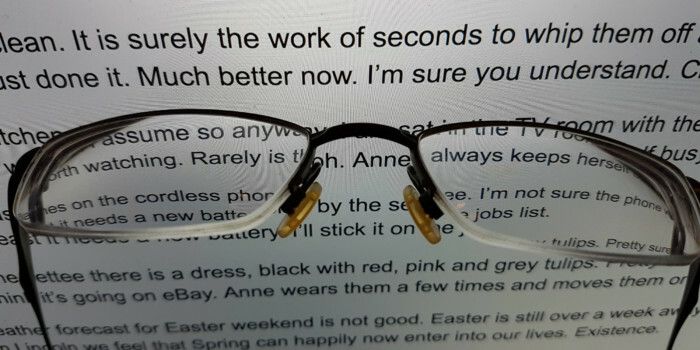 My specs need a clean. It is surely the work of seconds to whip them off and wipe with my shirt. In fact I’ve just done it. Much better now. I’m sure you understand. Clarity. Anne is in the kitchen. I assume so anyway. I am sat in the TV room with the TV switched off. Nothing on worth watching. Rarely is tbh. Anne always keeps herself busy. A red light flashes on the cordless phone by the settee. I’m not sure the phone works any more or at least it needs a new battery. I’ll stick it on the jobs list. Over on the settee there is a dress, black with red, pink and grey tulips. Pretty sure they are tulips. I think it’s going on eBay. 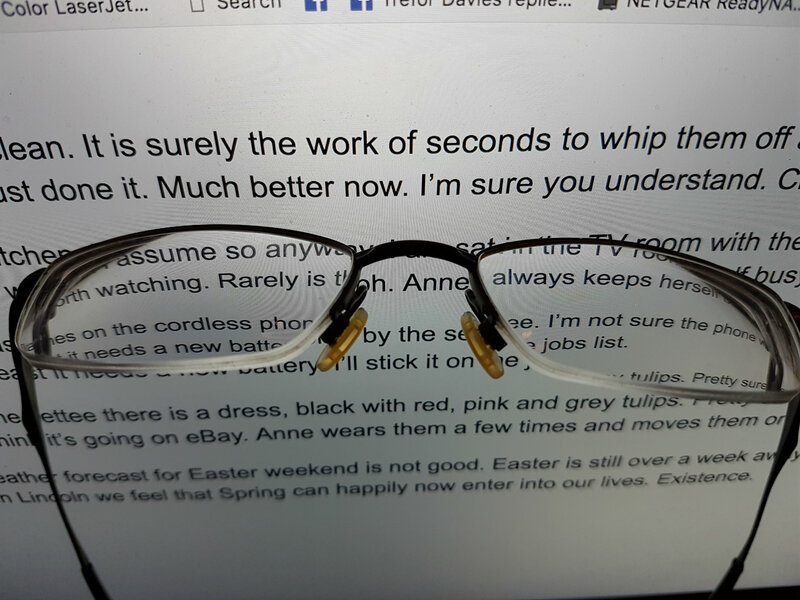 Anne wears them a few times and moves them on. The weather forecast for Easter weekend is not good. Easter is still over a week away but here in Lincoln we feel that Spring can happily now enter into our lives. Existence. I have been reading Mussolini, His Part in My Downfall by Spike Milligan. This is volume IV. I’ve just finished vols 1 – 3. Note inconsistent numbering conventions there. Reb. Been moving some books around. Need more space in the big bookcase in the living room where all my history books and the Welsh and Manx interest stuff resides. Book demotion. The printer is silent. It sits there patiently, waiting to spew forth. Maybe it’s watching me. We ignore it most of the time but it is connected, hackable. The answer lies in the socket. The featured image is a random photograph just taken for the very purpose. Felt a change was needed from the philosopherontap logo, excellent that it is. Specs have been cleaned. Posted on March 21st, by Trefor Davies in thoughts.